Maintain clear, healthy-looking skin with EvolutionMan Resurfacing Clay Mask; a revitalising, at-home treatment that delivers the benefits of a professional facial. 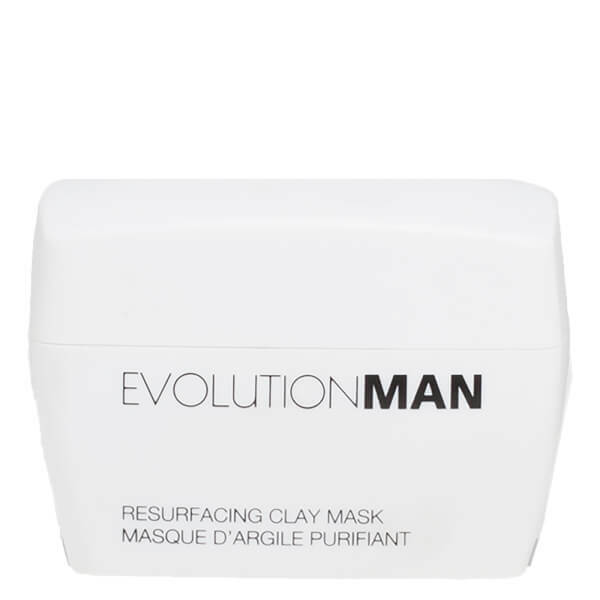 Catering specifically for men, the innovative formula utilises antioxidant-rich Witch Hazel and 'EXFO BIO' (a blend of Alpha Hydroxy Acids that are naturally derived from tropical fruits) to effectively draw out dirt and impurities from deep within the skin's layers. Working to clear and tighten visible pores, the clarifying face mask improves skin tone and texture, whilst targeting blackheads and whiteheads to reveal a smoother, more refined finish. Apply an even layer to cleansed skin avoiding the eye area, and leave on for 10 minutes. Rinse thoroughly with warm water in gentle circular motions. Use up to 3 times a week. Water/Eau (Aqua), Kaolin, Bentonite, Alumina, Glycerin, Propanediol, Glycolic Acid, Hamamelis Virginiana (Witch Hazel) Extract, Disodium EDTA, Potassium Sorbate, Salicylic Acid, Spondias Monbin Pulp Extract, Mangifera Indica (Mango) Pulp Extract, Musa Sapientum (Banana) Pulp Extract, Iron Oxide (CI 77492), Camellia Sinesis (Green Tea) Extract, Niacinamide, Tocopheryl E Acetate, Sodium Ascorbyl Phosphate, Aloe Barbadensis Leaf Extract, Cymbopogon Schoenanthus Extract, Calendula Officinalis Extract, Chamomilla Recutita Matricaria Extract, Macrocystis Pyrifera Extract, Rosa Canina Extract, Allantoin, Panthenol, Fragrance.